1704, Used Rims, 15X6-1/2, 5 LUG, 4-1/4", 90-97, LINCOLN, CONTINENTAL, SILVER 20 SLOT WITH DIMPLE UNDER EACH SPOKE, ALLOY. 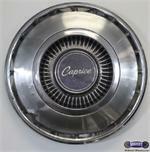 3024, Hubcap used, 14", 68-69, CHEVY, PASSENGER, CAPRICE, 20 SLOT TYPE, BLACK PAINTED RIBBED CENTER, WORD CAPRICE IN CENTER, METAL CLIPS. 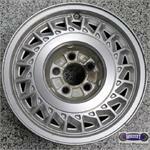 5083, Used Rims, 16x6, 5 LUG, 155MM, 00-'01, Chevy, Impala, Monte Carlo, ALUM PAINTED METALLIC SILVER, 20 SLOT. 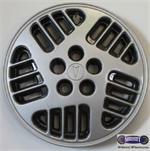 5103, Hubcap used, 14", 92-94, PONT, GRAND AM, SUNBIRD, 20 SLOT TYPE SPARKLE SILVER WITH DARK GRAY POCKETS. LUG NUT RETAINING CAPS USED. PLASTIC CLIPS. 61027, Hubcap used, 14", 80-81, TOYOTA, CORONA, CHROME OUTER RING, SILVER PAINTED SLOTS AROUND EDGE, 20 SLOT TYPE WITH RAISED, MACHINED CENTER & BLACK, CHROME WORD TOYOTA IN CENTER, METAL CLIPS. 879, Hubcap used, 14", 89-92, FORD, PROBE, 20 SLOT TYPE, SILVER PLASTIC CAP, ROUND RING IN CENTER, SMALL BLUE FORD OVAL, 6 PLASTIC CLIPS, WIRE RING.